Use Waitrose 100% Italian Extra Virgin Olive Oil for salad dressings, salsa and marinades. Its depth of flavour also makes it ideal for an Italian pesto - a combination of nuts, herbs, Parmigiano-Reggiano and garlic. This recipe uses walnuts instead of the more usual pine nuts. Heat 2 tbsp of the olive oil in a small pan, add the walnuts and sugar, and toss over a medium heat until the walnuts are lightly toasted. Tip into a bowl and leave to cool. Reserve 1 tbsp oil and place the remainder in a food processor with the garlic, parsley and chives. Blend until finely chopped. Add the cooled walnuts, Parmigiano-Reggiano, mustard, vinegar and 5 tbsp cold water. Whizz together to form a dressing and season to taste. If the dressing is too thick to drizzle, add an extra 1-2 tbsp cold water. Heat a large frying pan or griddle. Season the chicken and brush with the remaining oil, then add to the hot pan or griddle and sear both sides. Reduce the heat and cook for 8-10 minutes each side until thoroughly cooked, there is no pink meat and the juices run clear when pierced. Divide the salad between 4 plates and place a hot chicken breast on each. 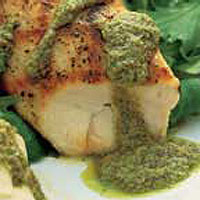 Drizzle with plenty of the dressing and serve with warm crusty bread. Note: Wash hands, equipment and work surfaces well after handling raw poultry. Follow this main meal with frozen Waitrose Raspberry Brûlée Cheesecake.